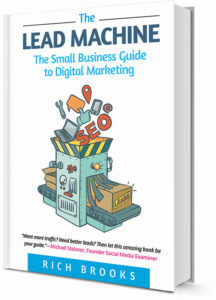 This book is for marketers, entrepreneurs, and anyone looking to generate more leads from their website. What? If you read it? Well, assuming you’re paying attention, you’ll learn how to develop a more effective website that turns visitors into customers. That generates leads. That builds your email list. That grows your sales and your company. You’ll discover how to drive qualified traffic to your website through search, social media, and digital ads. You’ll find out how to stay in touch with people even after they’ve left your website with email marketing, retargeting, and other tactics. You’ll see how to read and analyze your website traffic reports so that you can continually improve your results and your bottom line. Because when I tried to teach digital marketing through an experimental dance troupe I got booed off stage. I mean, what experience do you have? I’ve been running flyte new media, a digital marketing agency, for twenty years, helping small businesses generate leads online. I also founded The Agents of Change, an annual conference and weekly podcast all about search, social, and mobile marketing. I also speak and present all over the country on topics of digital marketing, entrepreneurship, and just about anything else related to growing a business online. Oh, absolutely. Of course, I’m biased. But if you’re still not sure, you can head out to your local bookstore and thumb through a copy or use the Amazon Look Inside feature. Oh, they love this book. Trust me. Everyone tries to make life so complicated. Rich Brooks cuts through the mess of complexity and straight to what matters. His guidance will set your business on FIRE! And I have plenty more where those came from! Jay Baer, Dave Kerpen, Mari Smith, Chris Brogan, Sue B. Zimmerman and more have all weighed in. Your guide to digital marketing and generating more leads online!